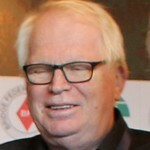 Gunnar Hallberg started his bridge life as a Swede and was a regular on their national team during the 1980's. He was 6 times Swedish teams champion, Nordic champion and European silver medalist. He moved to England to play bridge professionally in 1995 - and is still an even more unpopular opponent in London’s rubber clubs than on the tournament scene. A losing semi-finalist for England in the 2000 World Olympiad, he has won the Cavendish (teams), the Australian championships and North America's prestigious Vanderbilt trophy (becoming the first Brit ever to do so). In 2002 at the Rosenblum in Montreal, Gunnar reached the quarter final stage. He finished fifth place at the 2005 European Open Teams and the European Mixed Teams in Tenerife. In the Summer of 2009, Gunnar reached the final of the European Pairs at the European Open Championships in Sanremo, Italy. Later in the year , Gunnar partnered John Holland and won the Gold Medal in the Senior Bermuda Bowl together with the English team. More details can be seen here. In 2014, Gunnar was part of the England Seniors team which won the European Championships, and in 2015 he was part of the England team which reached the quarter-finals of the D'Orsi Trophy at the World Bridge Championships. In February 2016 he won a silver medal at the EBL's European Winter Games in Monaco.